Musings on Finding Light by Tamara Riva--One girl's perspectives, opinions, and thoughts about finding the positives when clouds hover above, as well as musings about books (mostly children's and young adult literature) and any other ideas that I feel like sharing. A picture book may show only static, non-moving images on the page, but if we allow the images, along with the book's text to merge in our mind we can travel to other worlds without a computer or other electronic device. So many people, including kids, view picture books as being only for young children. 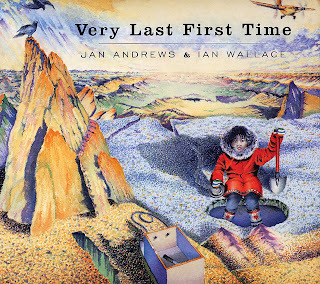 I know I've written about this before, but I feel I must continue to reiterate how picture books can be like a sample taste of something larger - a small introduction to a grand new concept. This week's book provides an introduction to a practice performed by another culture - a practice that will likely be new and fascinating to readers. I first learned about the book and story many years ago at a professional development session focusing on the use of picture books in the secondary school setting. I have not forgotten it since. On the day of the story, Eva, a young Inuit girl in Canada, prepares to partake in a tradition of walking solo on the seabed floor below the ice to gather mussels for food. Until this day, Eva had always accompanied her mother on the journey. The two women venture together to find just the right place in the already cracked ice. They make a hole. Then, Eva, along with needed supplies, descends into the darkness below the frozen surface. With the tide out, Eva lights candles and explores the undersea wonderland as she searches for mussels. Colorful illustrations, like the hues of a coral reef, fill the pages. Readers can see Eva discover mussels, coral, anemones, and other creatures and plants that usually dwell in the water's depths. The author and illustrator show Eva's curiosity and wonder through the text and images. While the story does not delve into the hazards of walking beneath the ice, the author creates tension when Eva hears signs of the returning tide. Her fear grows as she realizes she must find and return to the hole where she entered the undersea world before the water returns. Did she venture too far? Cries for help go unheard, but Eva has done this before with her mother. Can she finish her task and be all right? Will her solo journey be her only time, or only her very last first time of traveling alone? Prior to learning about and reading this book, the thought of venturing below the ice had always been more of a fear of breaking through and falling into the freezing water below. Imagining what it would be like to first have the tide continue to ebb and flow, and then be able to enter the world below the ice when the tide flows out, both scares and fascinates me. Knowing now that this is a real thing, makes it all the more compelling. As I've researched more about the Inuit practice, I've learned how the harvesting of mussels beneath the ice is not a daily adventure. The phases of the moon work along with the tide. When the moon is full, the tide stays out the longest. This scientific phenomena, alone, fascinates me. The process involves a great number of risks including drowning due to being caught beneath the ice when the tide flows back in, losing the hole where the person entered the sea because of thinning ice shifting and blocking the hole, cracking and breaking ice not supporting the weight of the travelers, and more. An online search using the phrase "harvesting below the ice" (one of many search terms I've tried) reveals videos and articles that share about the experience of real people who, despite the dangers, continue the practice today. Learning about the practices of other cultures, especially when it comes to survival and meeting basic needs, teaches us about the world in ways we would never know if we weren't willing to look beyond our personal experiences. Each time I learn something new, it is a discovery. And, unless my learning reveals something that disturbs me, something that I wish I had not learned about, I almost always feel enriched. My daughter asked me about the title of the book. "I don't get it," she said, before I read her the story. I then explained how once we learn or do something for the first time, there will never be another first time. We talked more, and it made sense. There are countless activities we can say we've done for the very last first time, but some are greater than others. What is an activity you have done that you can look at in awe and recognize that your attempt or accomplishment was truly the very last first time you did it? Can you name a picture book you've read during your life that took you on the first step (as it provided an introduction) to greater learning? 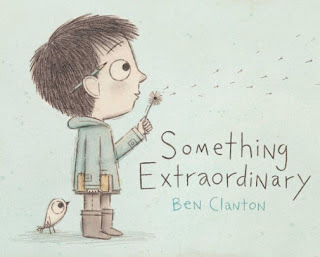 I would love to read more about picture books that gave you a taste of something larger. For now, to more last firsts! Ever since I was little, I dreamed of magic happening to me. I wished fairies would visit. I wished I could travel to a magical world where animals talked and unicorns existed. I wished I could shrink and be friends with my dolls. When I felt lonely, I wished something magical would happen. Today, when I visit cloudy places in my mind, which self-doubts frequently steer me toward, I wish and hope for that magic to appear outside of my head. I want it to be real. I hope. I look. I try to see. Self-doubting hinders the vision, so reminders help me see--at least for moments. As I continue to acquaint myself with the library book collection in the media center where I now work (since January), I discover new books that make me think, smile, and see. One of my recent finds is this week's book. In fact, it is a new overall favorite of mine. The main character, a young boy, has many wishes. He wishes for abilities (such as being able to fly or move things with his mind or talk to animals). He wishes he had a bushy tale. He wishes the rain would fall in colors. He wishes for many things, but he longs for something real to happen outside of his imagination. He reminds me of myself. The story concludes when suddenly, something real happens, right in front of the boy. He does not have to look, as he can see that the magic becomes real when he notices something that already exists. Something ordinary to some folk, may be extraordinary to others. To the boy, his discovery is truly extraordinary. I have seen his extraordinary find, and also believe it is beautiful and wonderful. The magic of birds singing together, and filling the air around trees with lively chatter. and song--this is something extraordinary. Something Extraordinary may be a picture book for children, but its message can touch people of any age. It touched me. I could not return this book to the library without knowing that I can continue holding on to the story and message in my home. My brand new copy arrives in a couple of days. Magic, depending on how one defines the term, exists everywhere. We only need to open our eyes to see it. What is some real magic that you see? What is your "something extraordinary" find? I dare you to share your thoughts. Perhaps what you see will help another reader gain sight. Being a teacher, a mom, and a writer all have me living daily in what I call "subjective" or "abstract" roles. The titles themselves are "concrete" and "fixed", but the tasks within each are forever open-ended. I remember a time when I worked as a math tutor at a community college. Someone who knew of my writing asked, "are you one of those writing people who does math?" I guess I was, and still am (up through basic algebra, and then you can count me out). I love math because it is concrete. Problems are like puzzles. I can approach them from a variety of directions, but if I solve them correctly, the final solution is the same regardless of my method. When I teach math, I frequently instruct my students in how to use multiple methods for solving the problems. While I want my students to at least learn how to use the different methods, I ultimately let them choose their preferred method, provided they can show their work or explain their process. I need math and other concrete thinking in my seemingly abstract life, because at least once I solve a problem, my work is done. With parenting, teaching, and writing, I never know when I am finished. And, for someone like me, who questions and/or doubts herself often, having some concrete/fixed closed-ended results helps keep me grounded. A couple of years ago, I learned about Hour of Code (Hour Of Code) and discovered the power of writing simple code to accomplish a task and solve problems. This week's book, one of several connected to the "Girls Who Code" movement (and the first book that made me aware of "Girls Who Code") brings coding to life off of the screen or in unplugged mode. Meet Pearl, a young girl who chooses to spend her final day of summer vacation building a sand castle. Since past building attempts flopped due to a variety of events beyond her control, such as a "shark attack" and "flying saucers" (not as bizarre as they sound, thanks to the illustrations), Pearl is determined to achieve success with the aide of her robot, Pascal, following "code" or a set of instructions that a computer can understand. Telling Pascal to only build a sandcastle" means little to a robot. Pearl realizes that if she thinks like a coder and breaks the large task into smaller tasks that make sense to Pascal, then together they can accomplish her ultimate goal. Pearl also realizes that each instruction needs to be clear and specific, such as where to build. Without parameters, Pascal might build too close to water or not even in the sand. At times, such as when gathering sand, Pearl recognizes the need to use a "loop" or a way to repeat directions multiple times without having to write them again and again (similar to how we may do 5x7 instead of using repeated addition of 5+5+5+5+5+5+5). Pearl continues to learn about the importance of specificity when Pascal attempts to fulfill tasks without limits. When she tells him to gather "fancy decorations" for the sandcastle, while she gathers seashells, Pascal grabs a lifeguard tower complete with lifeguard, a pacifier, and other items he comes across. This leads Pearl to implement "if-then-else" conditions so Pascal will consider if each item meets certain criteria to collect or if he needs to then search for something else. When all finally appears good, another unforeseen event occurs. Rather than viewing this as a failure, Pearl remembers that she already wrote the code, so she doesn't need to start over. She only needs to identify where the problem occurs in the code and then add a fix. Once Pearl finally achieves her goal, she realizes there is no stopping her from building more. 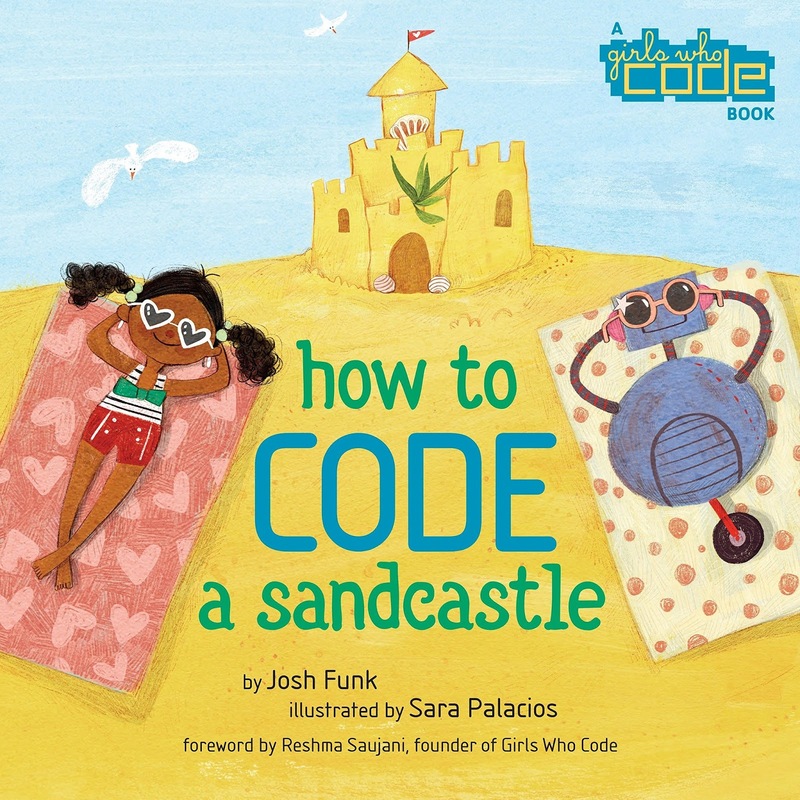 How to Code a Sandcastle is a book that makes the basics of coding accessible and relatable to real-life off the screen. The humorous illustrations along with the clear writing together make the story not only fun to read, but also educational. While I love learning to code on a computer or tablet, I appreciate having a non-technology tool that can help me introduce coding to others. What is something that helps ground you in the abstract/subjective parts of your life? I welcome you to share in the comments below. The End is Near--or is it? Potty Talk is Hilarious! Nature can be gross! How Many Blog Views So Far? © Tamara Riva and A Boot, A Belly and A Cane, 2017-2019. Picture Window theme. Theme images by Airyelf. Powered by Blogger.